Sea salt baked fish not only looks incredibly adventurous but the end result is a perfectly cooked fish, with minimal effort. The salt lightly seasons the fish and also helps to keep the rosemary flavour in. Wash the fish inside and out and then pat dry the scales. Leave the scales on as they help to keep the moisture in as the fish cooks. 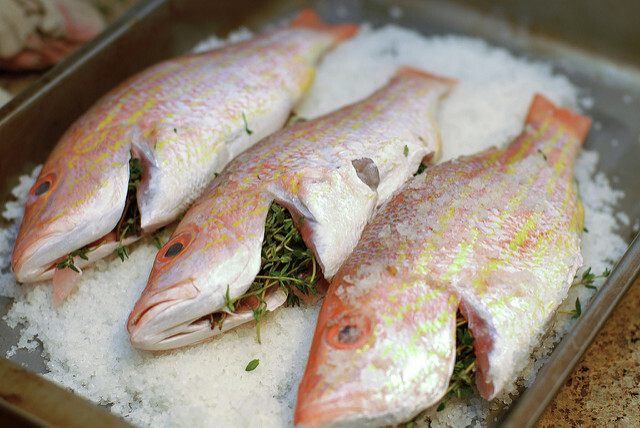 Create a bed of sea salt for the fish on the bottom of a roasting tin and lie the fish on top. Cover the top of the fish with sea salt so it is completely enclosed in salt. Sprinkle a little water on top of the salt to help the crust form. Put the tray in the preheated oven and cook for 25 minutes. Take out and allow the fish to cool. With the tip of a knife, carefully slice down where the spine of the fish would be without touching the fish and remove the salt casing. Brush away any excess salt left on the fish. Gently move the fish over to a platter, score it with a fork and peel back the skin. For a real Mediterranean feel, serve the fish with a side of avocado salsa. Just mix chunks of avocado, chopped tomatoes and 1 finely sliced, small red onion with 3 tablespoons of olive oil.